Various factors vie for importance when considering the need for window treatments. Controlling the amount of light in a room is a primary goal. Too much light can cause fabrics and textiles to fade prematurely, and glare from sunlight can be annoying. Temperature control and energy efficiency is another consideration for which window treatments are required. In fact, the right combination of treatments can save a considerable amount of heat in the winter and cooling in the summer. The money you save in reduced energy consumption will help to pay for your investment in window treatments! 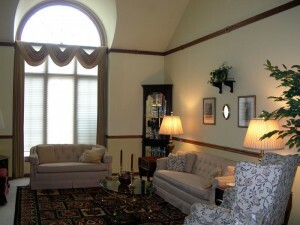 Finally, the aesthetic reason for window treatments is to enhance and unify the interior design. Gracefully pleated fabrics introduce a soft, vertical element into your room. Whether you use a luminous silk, a textured lace or casement fabric, or a woven or printed pattern that develops the style of the room and furnishings, nothing makes a bigger statement in a room than a well designed window treatment! “Window treatment” refers to the layering of hard and soft window products that are needed to answer all the issues that a set of windows presents. Hard treatments consist of shutters, vertical blinds, horizontal blinds, cellular shades, roller shades, and the like. These products offer light control, temperature control and privacy. They also have the advantage of being retracted when not in use so they become virtually invisible. Soft treatments consist of draperies and curtains. Called soft because of their fabric construction, they create a smooth transition for the hard lines of window frames and moldings. Soft treatments accentuate the vertical nature of windows and gracefully emphasize room height, instilling elegance and romance into the room. Top treatments are valances, cornices, decorative wood box-moldings, or swags and cascades. Toppers are any treatment that covers the upper 20% to 25% of the window + frame including the top of any primary soft or hard treatment, when used. Most importantly, it is the top treatment that can balance irregular window sizes and window placement creating a uniform effect around a room. They are also wonderful accents at the top of windows when used with a contrast fabric, braid or fringe. Decorative hardware is a popular finishing touch for drapery panels and top treatments; available in a wide range of styles from traditional to modern and in finishes from antiqued or polished metals, to stained and painted woods, they offer homeowners a wide selection of accent hardware to achieve the look you desire. How Do I Decide What Window Treatment is Right for You? The style of your room and furnishings, in addition to the window exposure, will help to determine the type of treatments used. An open-weave fabric curtain under an arched-bottom valance creates an informal, functional treatment suitable for your family room or home office. On the other hand, a graceful swagged top treatment with floor length cascades accentuates the dramatic vertical element in the room shown above. The fabric, a tone-on-tone stripe sateen, enhances the graceful folds infusing this living room and dining room with elegance and formality. Whatever your style may be, designing a treatment and selecting the fabrics that complement your room decor can be one of the most challenging and rewarding parts of Interior Design. Treatments, as well as fabrics, represent varying levels of formality. I can assist you in the selection of these products. I work with my clients one-on-one to help you find a range of fabrics and treatment options. Then we fine-tune the treatment style and narrow the fabric selections until an appropriate combination is developed for your room. The preliminary work done in planning and developing your window treatment ensures your total satisfaction on the day of installation, and the admiration and compliments of friends and family for years to come. I welcome the opportunity to work with you on your design project. Call me today for an appointment.